Proud to present the next incarnation of the TX7 panel as a result of successful co-operation with forum member pascalc, who has done the Lua programming! 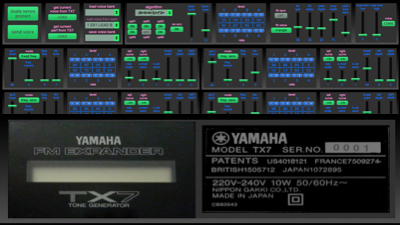 Now you can load and save voice banks and individual voices from your computer or straight from the TX7 synthesizer. Heya! Love this panel (guess i will hit the donate button soon…) … BUT i have problems loading banks (both from file and from my TX7), getting a “Callback error” all the time. Any suggestions where to start looking for the problem? Thanks for the comment. Yes it is quit important to setup the MIDI IN and MIDI OUT ports/devices in the right way. This doesn’t seem to want to work for my TX7, but Cntrlr seems to work fine for my other synths, including my TX81z and TG77. Any ideas what could be making my TX7 not want to listen to Cntrlr? I’m having few problem getting this to work so just wanted to check a few basics. There has been some discussion of the correct midi implementation, I would assume that the midi out of the laptop goes to the midi in of the TX7 and the midi in of the laptop goes to the midi out of the TX7. Then configure that way in CTRLR. The “controller” is actually a keyboard for playing the notes? Is that right? everthing needs to be set to channel one for some reason? I can’t load any sound banks (ones i’ve downloaded) and therefore I can’t save any either, is there a way to create your own? IT would be good to back up the current banks at least. The parameters do seem to work in the panel and i can get load the patch from the TX7 but I cant send patches or load anything from/to files. There is an option to buy software 1.4 on ebay, wondering if that might help? I think you have set the input/output requirements OK. Indeed the controller setting AFAIK is for playing notes. Question: when you select load bank ‘from file’ does it open a window so you can browse to the directory where your bank files are stored? BTW: I’m on a Mac, so maybe things work differently in Windows. My TX7 won’t respond when I try to send patches to it. It transmits them to this panel fine, but I can’t load any in and I can’t edit the sounds. I have everything set as it should be, I think. What must I do? I’m not sure, but I seem to remember you have to set up the TX7 to receive patches. I don’t have the TX7 anymore, so I cannot give you the settings, but I’m pretty sure it is in the manual. This panel is working great for me, using Win10 and a cheap USB midi interface. Did you click the button “disable memory protect”? hi i’m trying to load the ctrlr into maschine. and it works. i can control 2 operators with the internal rotary encoders of maschine and make macro’s for those. but when i want to connect more operators 3456 it does not remember the unique number connected to the macro control inside maschines software.. is there some kind of bug still that doesn’t give unique numbers to all parameters going in? it seems its working for operator 1 and 2 and all common functions to learn the functions to maschine though.